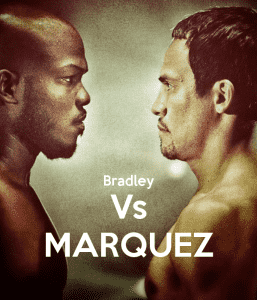 You are here: Sports Betting Online > Sports Betting Weekly Updates >	Does Marquez’s Experience Win Out Over Bradley’s Energy? Does Marquez’s Experience Win Out Over Bradley’s Energy? Interestingly enough, the two fighters who have most recently conquered Manny Pacquiao don’t command nearly the box office attention that Pacquiao does. Well, maybe that’s not much of a mystery, because it’s boxing. But the showdown between Juan Manuel Marquez and Timothy Bradley will be an interesting one nonetheless for boxing bettors who like to experiences intriguing clashes of style in the sweet science. Their bout, in which the WBO welterweight (147) championship is at stake, is slated to take place at the Thomas & Mack Center in Las Vegas on Saturday night, and will be available on HBO Pay Per View. Marquez (55-6-1, 40 KO’s) has won recognized world championships at featherweight, super featherweight (130 pounds), lightweight and light welterweight (140 pounds). This will be a second attempt to win a title at 147 pounds. He had been turned back by Pacquiao previously. Aside from Pacquiao, he has lost to undefeated Chris John (in somewhat disputed fashion), Freddie Norwood (in his first try at a world title), Floyd Mayweather (where there was no dispute whatsoever) and Javier Duran (in his pro debut back in May 1993). All told, he has been involved with 17 world championship fights. Bradley (30-0, 12 KO’s, with one no contest) has only been around since 2004, and is a babe in the woods compared to Marquez. He glided through most of his early fights, winning something called the WBC “Youth” title at 140 pounds, then beat Junior Witter for the WBC’s “regular” world championship at 140 in May 2008. One of his big wins as a champion was a decision over Lamont Peterson, who was previously undefeated, in December 2009. He beat Devon Alexander by technical decision in what was considered to be a “showdown” and a unification fight at 140 in January 2011, but it drew few fans to the cavernous Silverdome outside Detroit. Of course, the shining moment for Bradley was his split decision win over Pacquiao, which took place last June. However, it was tainted in that ringside observers, boxing bettors and fans almost unanimously saw Pacquiao as having the clear advantage. That didn’t count for anything, though, with the people who mattered. Bradley won by two points on two of the judges’ scorecards – one of them being the now-infamous C.J. Ross. The third judge had PacMan winning by two points. There was universal outrage about the decision, although this did not create any fuel for a rematch; one of the reasons was that Bradley’s drawing power was limited, and aside from that, he demanded a minimum of $10 million to get into the ring with Pacquiao again. So he soldiered on, and found himself nearly derailed in his last fight against Ruslan Provodnikov on March 16. Bradley, a big favorite in the boxing odds, was hurt early and hurt late, as Provodnikov kept coming. In fact, he went down in the 12th round. He also showed some flashes of extraordinary ability. In the end he was able to escape with a victory, winning by three points on one card but only a single point on the other two. It is very rare that a fight between combatants with this level of status in this sport would be so close to being a “pick’em,” and indeed there are very good reasons to recommend either side here. For Bradley’s part, one could point to the proposition that the 30-year old Palm Springs resident has a style that is based largely on having lots of energy punches that come from odd angles, with an ability to improvise, and some durability, which could potentially spell problems for the 40-year-old Marquez. The advantages for Marquez (the -150 favorite in the Bovada boxing lines), who has been around a lot longer, would seem to be obvious, in the sense that he has a much more varied scope of experience, having proven himself to be worthy against fighters of all kinds during the course of a 62-bout career. The most notable encounters of Marquez’s career have taken place against Pacquiao, against whom he boxed to a controversial draw (in which he suffered three knockdowns) and lost two controversial decisions. The fourth fight between the two did not bring about a result with much controversy, though, as Marquez caught Pacquiao with a straight right hand in the sixth round and knocked the Filipino out cold. Backers of Pacquiao, in a quest to taint the result, would remind fans of Marquez’s association with Angel Heredia, a “conditioning coach” who had previously been a peddler of illegal steroids who testified for the government in the infamous BALCO case. It was noted, rather accurately, that Marquez was able to accommodate a higher weight class and looked as strong and muscular as he had ever been in his career, and at the age of 39 no less. For various reasons, including the possibility that he wanted too much money, Marquez has not been amenable to a fifth fight with Pacquiao, and he has not been in action since that December 8 victory. If you hang around boxing enough, you’ll hear people talk about how boxers sometimes “get old overnight.” Marquez would appear to be a candidate for that, given his age and his current stretch of inactivity. At the same time, there is a boxing adage that in a fight between a guy who throws rounded punches and a guy who throws straight punches, the fighter who throws straight punches is the one who deserves the longer look. In this case, that would most definitely be Marquez. One of the things that has been rather consistent about Bradley (the +120 boxing betting underdog at Bovada) is that he has been able to throw straight right hands early in a fight, only to regress into round, looping punches as the bout progresses. And whereas he has some zip on his blows early on, they tend to lose steam over time, to the point where he has a tendency to slap late. Don’t get us wrong – there are some things that are virtuous about Bradley; he is far from mechanical, he has a lot of heart and he is not a bad ring general. But ultimately when a fighter encounters elite opposition, those round punches had better be thrown with a lot more force (like say, Orlando Salido, who’ll fight a title bout on the undercard against Orlando Cruz) or the opponent will walk through it. This is what we suspect could happen with Marquez. Let’s face it – Tim Bradley is not going to knock out Marquez early, unless he catches him cold with something completely unexpected. And of course, the boxing betting odds accurately indicate that this is most likely a distance fight. Over the course of a distance fight, Bradley’s best hope is to outhustle Marquez at every turn. He’s going to have to steal rounds. But the more predictable scenario is that he is worn down by someone who is going to keep coming and won’t give him a breather. You might even want to give Marquez an outside shot at the late stoppage; after all, Bradley was hurt on several occasions by Provodnikov, who was a junior welterweight moving up. Marquez is plenty smart enough to know what his game plan should be, and we think that at the -150 price, he represents enough value to place a premium play.